Quick reviews of two fragrances from Lush (Kerbside Violet and All Good Things), two from Imaginary Authors (The Soft Lawn and Yesterday Haze), and one from Memo (Inlé). A lovely gentle violet with jasmine and ylang. It's sweetish but not too sweet, and nothing like so strong and sugared as the brand's Tuca Tuca. Luca Turin aptly describes Kerbside as a successor to Ernest Daltroff's Violette Précieuse (Caron), a fragrance I bought unsniffed in my very early perfumista days, took an instant disliking to, and swapped away, only later, of course, to wish I'd kept it until I'd grown into it.1 Kerbside Violet replaces the Caron's dark, musty / off-kilter base with a milder, easier-to-wear rosewood. The dry down has a slightly earthy undertone underneath a creamy powder finish. If Atelier Sous le toit de Paris was too conventionally girly-pretty, and Comme des Garçons + Stephen Jones was too spendy to even consider, it might be the violet you need. On my buy list. Lush Kerbside Violet is available in 10 or 30 ml liquid, 12 g solid. For buying information, see the listing for Lush under Perfume Houses. Lest you find the name too cheerful, it's meant as the start to "must come to an end", and the description goes "Both bitter and sweet, representing a parting of ways and celebrating new beginnings. A sweet, boozy stumble down a dark basement staircase will leave you in a blissed out cloud of candyfloss and black pepper." And it is slightly boozy and slightly smoky, early on at least, but it's also got a good dose of rose-vanilla candy over a musky cedar base. Add subtle warm spices, and it all adds up to something of an eccentric comfort scent. It goes in my "I'd wear it if I had it pile", but there are other Lush fragrances I'd be more likely to spend my money on. 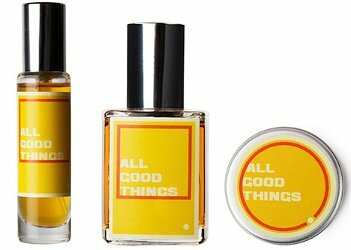 Lush All Good Things is available in 10 or 30 ml liquid, 12 g solid. The Soft Lawn was a 2012 release from this indie niche brand featuring fragrances inspired by imaginary books by imaginary authors. The coming-of-age story "follows Hampton Perry, a charmingly snotty college tennis champ who, after years of having everything handed to him on a silver platter, finds himself handing it all back",2 via notes of linden blossom, laurel and ivy leaves, vetiver, oakmoss, fresh tennis balls and clay court. It's a soft and summery green with floral accents. The opening is bright and citrusy, the heart is a pretty linden-ish blend with faint accents of that tennis ball and clay court, still very green, and given the air of an early June day by a discreet aquatic / fresh note. The dry down is woody and a tiny bit earthy at first, more so later, and elements of the tennis ball (rubber) and clay court (mineral) eventually take over. It's all very nicely done, and not so overly quirky as to be difficult to wear. The Soft Lawn made me smile, but I already have an extensive collection of summer greens, and it did not make me reach for my wallet. Worth a shot though, and this is just the time of year for it. Imaginary Authors The Soft Lawn is available in 60 ml Eau de Parfum, $85. For buying information, see the listing for Imaginary Authors under Perfume Houses. I guess that sorta/kinda makes Yesterday Haze a flanker? No matter, it doesn't sound anything like Violet Disguise. Yesterday Haze is a gourmand, with a near perfect balance between creamy, sweet, woody, earthy and bitter elements. In keeping, perhaps, with the 'haze' in the name, it doesn't immediately announce any of its notes (fig, iris, cream, tonka bean, tree bark, walnut bitters and orchard dust), but fans of fig in particular will find its unusual take on that note (is there another nutty fig? if so I can't think of it) worth exploring. As with The Soft Lawn, it is just quirky enough to confirm its indie roots, but not so quirky that you'll have to think of where you can wear it (although I do have a feeling it might overwhelm in hot weather). If Imaginary Authors did travel sizes, I'd give this one serious consideration. Imaginary Authors Yesterday Haze is available in 60 ml Eau de Parfum, $85. "An osmanthus submerged in a cloud of tea" — hey, that sounds tempting, no?4 Of course, I've already got the brilliant Osmanthe Yunnan from Hermès for bracing and dry, and there's Parfum d'Empire Osmanthus Interdite for a fuller, fruity-leather take on osmanthus + tea. Inlé, named for the lake in Burma, takes the delicate and fresh approach. It's a little breeze of a scent, pretty, with a bright green-ish citrus opening and a transparent blend of osmanthus and jasmine mingling with what smells like a pale green tea with a sprig of mint (the notes: bergamot, artemesia, mint, osmanthus, jasmine, mate, dried grasses, iris, cedar and musk). It's charming if perhaps a tad too placid for my taste; still, like The Soft Lawn above, it made me smile. Memo Inlé debuted in 2007, and was developed by perfumer Aliénor Massenet. It is $210 for 75 ml Eau de Parfum. For buying information, see the listing for Memo under Perfume Houses. 1. Violette Précieuse was discontinued, then reissued in 2006. I do not know if they're still making it, but even in 2006 people said it was not as good as the original. 2. Quote via Imaginary Authors. 4. Quote via press materials from Memo. Hey Robin, have you managed to try Lush’s Smuggler’s Soul perfume? It apparently has sustainable Indian sandalwood oil in it, which is quite unique to them right now. I’ve only managed to get my hands on 3 from Series 3, and now I’ve reviewed all of them. Looking forward to these (hopefully) launching in the US. Sorry, should’ve added: yes I have! Bought a little 10ml last week, a nice sandalwood/vetiver combo with a lemongrass kick. I’ve seen it described as ‘hot sandalwood’ which is pretty accurate. Forgot about the US thing though, hope they launch there soon enough as they’ve been out in the UK for a while now. We often get Lush stuff very late. And that sounds lovely, thanks — will try to get some when I can! I have a 10ml of Smuggler’s Soul as well. Lovely sandalwood with a citrus and ‘cinnamon’ kick. Definitely worth trying! I love Yesterday Haze and I’m quite keen to smell Kerbside Violet. Thanks for the snapshot reviews! I would probably buy a 10 or 15 ml bottle of Yesterday Haze if such a thing existed. And still have quite a few to try from Imaginary Authors. I’m new here but had to comment on Imaginary Authors. I ordered 4 samples from the website and they sent me a couple free ones! (Maybe a mistake…?). Yesterday Haze is definitely my favorite of the bunch. You can buy 30ml bottles for $55 at http://www.helloamelia.com. Welcome, and congrats on your free samples! 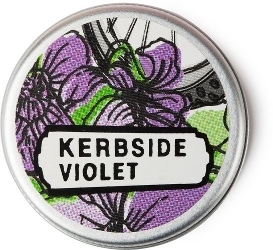 I really want Kerbside Violet – any idea when it will be available in the US? No idea, and couldn’t even swear it will be. Usually everything gets here eventually though. I would love it if Imaginary Authors did 7 ml bottles! Dame Perfumery sells them as such which is why I will soon make a purchase ! 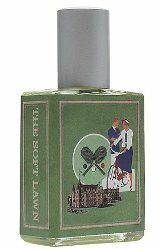 The Soft Lawn, particularly the ivy and oakmoss, sounds really good! Anything small that isn’t a rollerball would make me happy. Agreed on those 7 ml trial sizes from Dame Perfumery. I wish everybody did that. 7 ml is enough that you feel like you can really test a scent sufficiently, over several days. And Kerbside Violet is probably my favourite Lush scent in quite a while, nicer and less sweet than I expected. Agree, books! As gimmicks go, better than most, and frankly, the overwrought book blurbs are WAY better (and more amusing) than most overwrought perfume back story. I have still only tried 4 or 5 of them though, and neither of the ones you mentioned. True, it’s all well done and quite witty and just totally unobnoxious. I always feel that I would like the people who do it. Chiming in as the third voice to like the imaginary novel gimmick. The descriptions do double duty by poking gentle fun at the pretentiousness of both perfume press releases and fiction marketing blurbs. I enjoyed the novel summaries before I even tried Josh Meyer’s scents. My favorite Imaginary Authors is Memoirs of a Trespasser but I’ve gone through 2 samples each of Soft Lawn and Yesterday Haze and really enjoy them both. Yesterday Haze is on my buy list for fall 2015 but I can’t abide the thought of fall, too close to another winter! Of course I wish everyone had coffrets of 15ml bottles. Ugh, don’t mention fall and winter. It’s another cold grey day here. It’s Sam here from IScentYouADay. Thanks for these great reviews. I have been particularly keen to try Kerbside Violet and you have only whetted my appetite more! There was one Lush series where I disliked every single one, but the old stuff and the new stuff have been more promising. I must pop into my local branch next time I am in the big city (in my case dear old Cardiff). The new Lushes sound interesting. Violet can be an iffy note for me, but I want to try Kerbside Violet. All Good Things sounds good too. Interestingly enough, that’s also the title of a biopic about Robert Durst, if you want to fully torpedo any bright and sunny associations a name like All Good Things would bring up. I found this out because I watched The Jinx on HBO, and I think it came up since Andrew Jarecki directed both. The Imaginary Authors sound interesting too, though I haven’t been overly impressed with the ones I’ve tried thus far. I’ve tried three: Violet Disguise, Falling into the Sea (or something to that effect), and Orchidee [something] – I can’t remember the rest of the name right now. The only one I liked was Violet Disguise. That Yesterday Haze was done by the same perfumer makes me hopeful. I thought of the Durst movie as well. Haven’t seen the Jinx, but read all about it. Crazy crazy stuff. Robin, I enjoy and deeply appreciate these quick reviews of non-mainstream fragrances that are not so easy to find and test. I’m always a bit frantic about the risk of missing something really good among the flood of new fragrances that I’m not exactly going to trip over. I’ll try to sample Kerbside Violet and Inle. The osmanthus I like best currently is the TDC. I’ve been tempted by Manoa and Lalibela, and want to try more from that brand. BTW, both of those really sound worth trying, as well as La Via del Profumo Venezia Giardini Segreti, Bruno Fazzolari Lamp Black and Narciso Rodriguez Narciso. I have a ton of Memo samples I’ll work my way though (I think all but the last one). Love “the work of Swiss organic chemists filtered through the edicts of Danish dermatologists”, thanks for the quotes! And will second both Narciso & Lampblack, have not tried the Giardini Segreti. Good to have your confirmation on Narciso and Lampblack. My nose is usually in tune with LT’s, but there have been some NOTABLE exceptions. He doesn’t smell those spiky woods that I can’t bear, and, as you pointed out, he is sometimes beguiled by technical feats that are imperceptible to non-technicians. Well, will add that on Narciso in particular, I think it’s brilliant but not sure I’d wear it very often! But my nose is probably less often in tune with LT’s, so glad we agree on those. I got the tiny 10ml bottle of kerbside violet and am enjoying it immensely, not least because it’s in a spray bottle and not the awful dropper thing they use for smuggler’s soul (which I love also). I tried death and decay and liked the beginning a lot but found it petered out rather quickly into middle of the road white flower scent which I don’t need any more of. Most of the imaginary authors line seems interesting and worth trying! One of these days I’ll just get the damn sample box and stop hemming and hawing. I think that for most of them, even the 30 ml is spray. Not sure how Death & Decay rated the dropper.